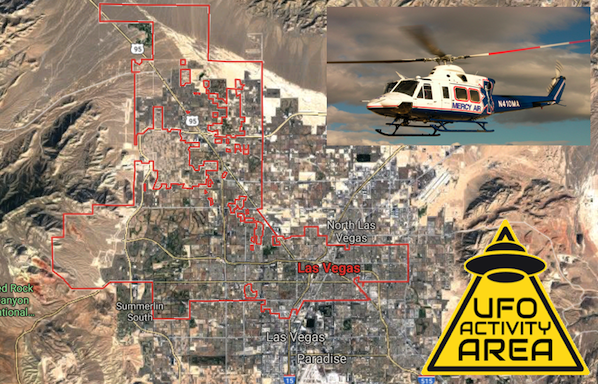 UFO SIGHTINGS DAILY: UFO Seen By Air Ambulance Helicopter Over Las Vegas, Nevada, Listen To Recording! March 2019, UFO Sighting News. UFO Seen By Air Ambulance Helicopter Over Las Vegas, Nevada, Listen To Recording! March 2019, UFO Sighting News. At 9PM on Saturday (yesterday) an air ambulance helicopter called Mercy Air 21 was 15 miles west of Las Vegas when the pilot noticed an strange object ahead of him. He was wearing a night vision visor which allowed him to see the object in better detail. When he told the control tower, they respond saying they saw nothing on radar. Balloons do reflect radar waves and can be seen on radar if a cluster of them are together or they are silver reflective material, but this one sounds big, it should have been visible regardless of the material it was made from. That means it was not a giant balloon. Also, its a well known fact that there is an alien base of Tall Whites as some call them, behind the old firing range at Nellis AFB in Las Vegas. Yeah, the base is part of the city. I will put the video of the Nellis AFB aliens at the bottom of this post. The pilot and control tower can be heard on the recording describing the large unlit round object at about 7,000 feet. Helicopter pilot: "Just to advise. It looks like I have some sort of object over the southern hills area. It looks to be about 7,000 feet. It could be a balloon or something along those lines. Its just unlit so be advised. Control Tower: "Ok. Uh, I'm not seeing anything in that area, but its not to say, like your saying theres something out there." Helicopter pilot: "Yeah, I can only see it...I got the night vision goggle on. I can only see it through the goggles." Control Tower: "Well thats awesome."